No one had ever seen anything like it. Nor would anyone again, until 1945, when an atomic bomb nicknamed “Little Boy” was dropped on Hiroshima, Japan. When the munitions ship Mont-Blanc exploded in Halifax Harbour on December 6, 1917, the 2.9-kiloton blast instantly incinerated the ship and vaporized everything near it, causing a swath of destruction and death over ten square kilometres of the city. Into this disaster zone rushed emergency personnel, aid and rescue workers — and reporters determined to get the story. 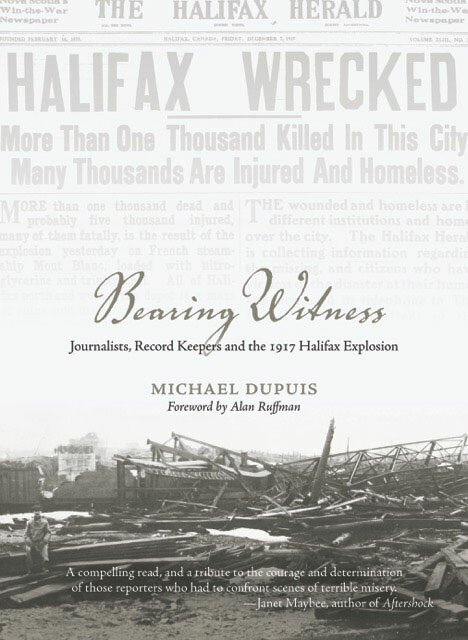 In Bearing Witness, Michael Dupuis tells the story of the Halifax explosion through the many dispatches and stories written by journalists who covered the disaster. While the explosion knocked out most communications to the outside world, the journalists’ eyewitness accounts and vivid reporting brought home the sheer, terrible scale of the tragedy. Many of their newspaper accounts are reproduced in this book verbatim, helping to transport readers back to ground zero in 1917. The book’s black-and-white photos and extensive footnotes enhance the reader’s overall experience.